You are here: Home / News / Diastasis Recti: To close or not to close the gap. Abdominal diastasis seems to be the issue that causes the most concern amongst pregnant women. It develops over the last stage of pregnancy as a result of the hormonal changes and the abdominal wall expansion to allow baby growth. It occurs when the two bands of the rectus abdominis separate due to a stretch of the collagen tissue that joins them, the linea alba. Abdominal diastasis can partly recover in the first four weeks after delivery, as part of the natural healing process. However, separation remains abnormal if no specific exercises are performed to achieve a complete recovery. The abdominal wall is designed to provide stability to the entire body and support the internal organs. When the structures that are involved in this role are overstretched, we are more likely to suffer from certain dysfunctions. Lack of support in the abdominal area is often the hidden cause of back, pelvic pain or even pelvic floor dysfunctions after childbirth. That’s why it is important to perform exercises that help improve muscle activation. But the question is, should be the closure of the separation the primary goal in the treatment of the abdominal diastasis? Are there other aspects involved? 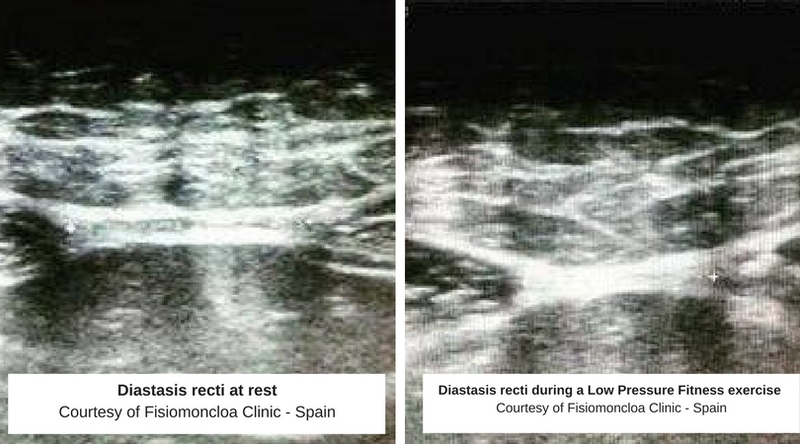 A recent study carried out by Diane Lee and Paul W. Hodges (2106) suggests a new approach in diastasis rectus recovery, taking more into consideration the response of the linea alba rather than just focusing on reducing the inter-rectal distance. For those not familiar with anatomy, the Linea Alba is the connective tissue, high in collagen that connects the two sheaths of the rectus abdominis. According to this study, patients with abdominal separation, when performing a curl up with no activation of the transversus abdominis, the distance in between the two bands of the rectus abdominis is reduced. Such effect does not happen to people with no diastasis. On the other side, when the transversus abdominis is preactivated, the distance between rectus doesn’t reduce as much as compared to an automatic curl-up. At this point, we could think that when aiming to reduce abdominal diastasis, we should then perform automatic curl ups without pre-activating transversus abdominins. However, there is another aspect we need to consider, the response of the linea alba during these exercises. 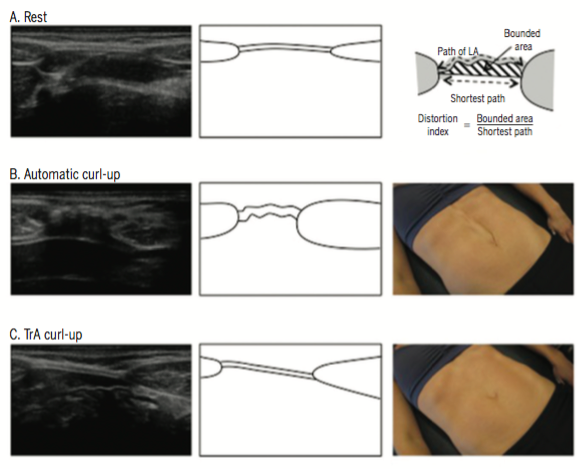 In this study, they found that when someone with diastasis performs an automatic curl up, the distance between rectus ir reduced, however, the distortion of the linea alba increases! On the other side, when the curl up is performed with a pre-activation of the transversus abdominis, the inter rectus distance increases but the Linea Alba tenses. Resource: Lee, D and Hodges, P. (2016). Following this research, professionals specializing in hypopressive techniques – Low Pressure Fitness were curious about what would be the response of the linea alba during these type of exercises. 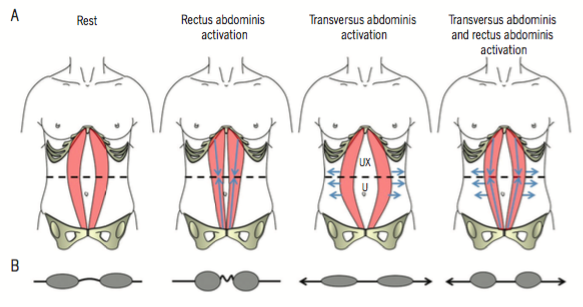 When performing a hypopressive abdominal exercise, there is an automatic activation of the transversus abdominis and pelvic floor muscles, visible as an up and inwards movement of the abdominal wall. The hypothesis was if the connective tissue that forms the linea alba would increase its tension during this action. This experimental study has found that standing upright poses included in the Low Pressure Fitness – Hypopressive routine enhances linea alba tension and slightly reduces the distance between rectus abdominis bands, and therefore, diastasis measurements. 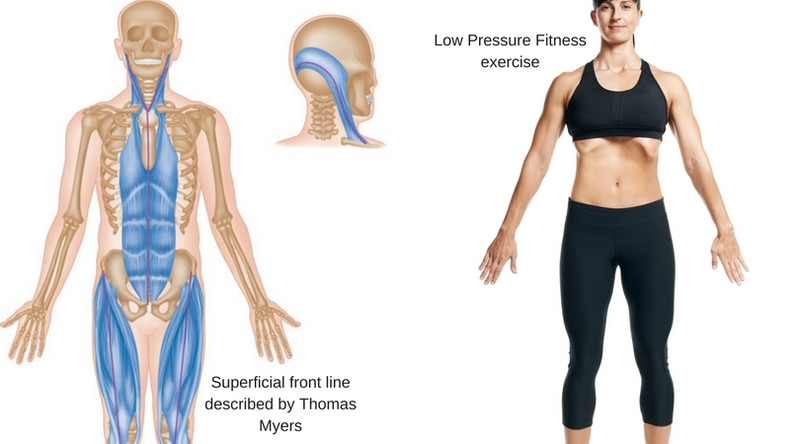 This phenomenon coud be explained by the fact that when performing an upright pose of the Low Pressure Fitness – Hypopressives routine, and following its postural principles, we are tensing the superficial myofascial front line, described by Thomas Myers in his book Anatomy Trains. Based on the research published by Hodges, we would probably think that performing curl-up based exercises are then recommended for women with diastasis as long as the transversus abdominis is pre-activated. However, we should keep in mind that curl-based exercises provoke an increase in intra-abdominal pressure that can be detrimental to pelvic floor health and not recommended for women suffering from pelvic floor dysfunction or recovering after childbirth. Although more research is needed to conclude the type of abdominal training that leads to better cosmetic or functional outcomes for women with DRA. These studies suggest considering the other approaches in diastasis recovery with a more functional perspective. In this line, Low Pressure Fitness – hypopressive exercises have the added value of reducing intra-abdominal pressure as well as helping restore the co-synergy of the core and pelvic floor muscles for better support and continence. Although the mechanisms by which this technique brings improvements in patients with pelvic floor dysfunctions and post-natal recovery are not clear yet, clinical studies and other research suggest this method can open a new avenue in core and pelvic floor restoration after childbirth. This post is a wonderful explanation of Diastasis Recti. I love that you use diagrams, and Anatomy Trains idea. Have you see Muscle and Motion’s description of the abdominals? It is a software program that Anatomy Trains has joined with to provide 3D videos. Anyway, they describe the Rectus abdominus as NOT inserting into the linea alba. That it is the aponeurosis of the other 3 abdominal muscles that insert into the Linea alba. Thank you for you amazing content!